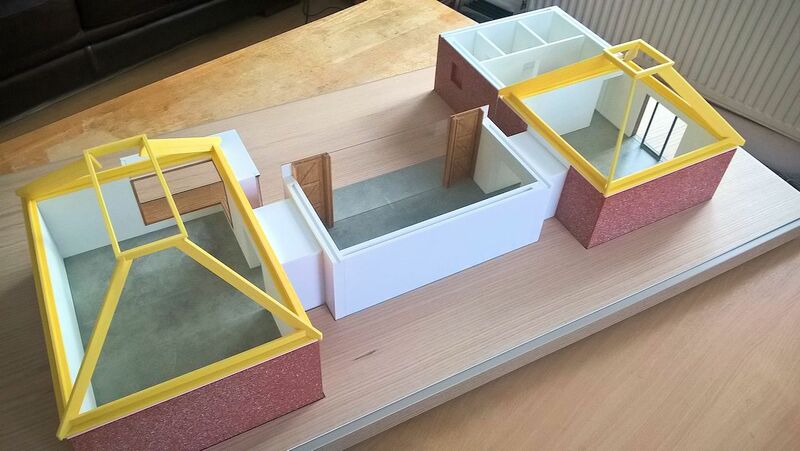 This follows on from An architectural model: Part 1 posted on January 12 where I outlined the purposes of the model, expanded a little on the use of foamed PVC for the build, and detailed my methods for achieving a convincing polished concrete effect. In this second part I am looking at the rest i.e. 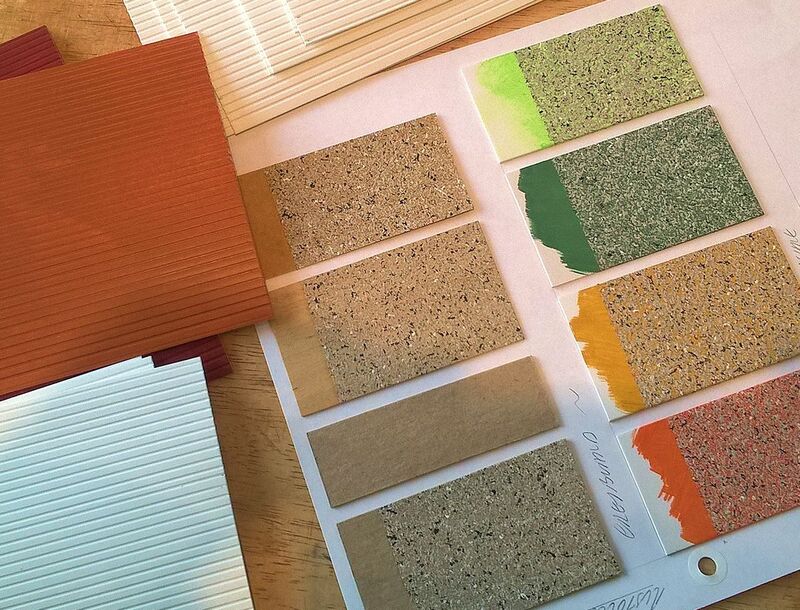 the ‘generalized’ treatment of the brick walls; my methods for staining the woodwork features; and lucky solutions re the baseboard and veneer cladding. 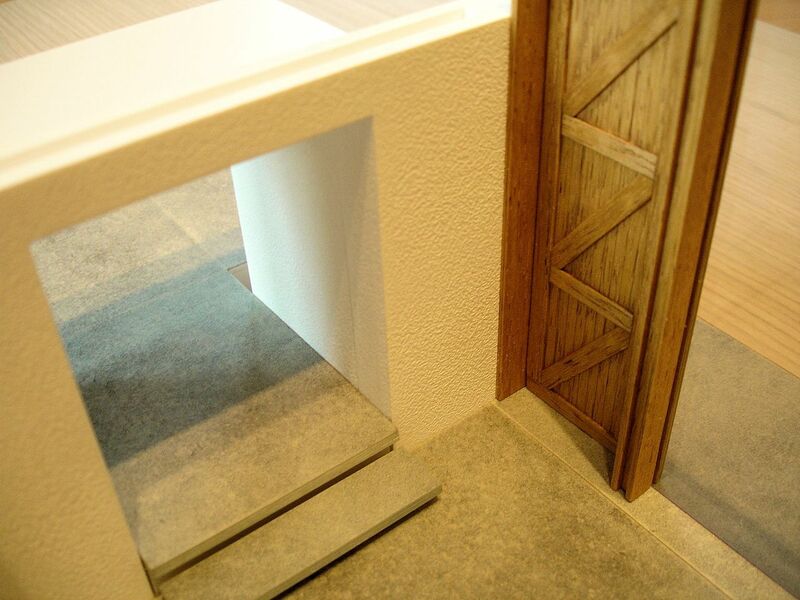 The natural wood chosen by the architect for this project is oak. In Part 1 I explained that I was hoping to emphasize the model’s own sculptural presence, and it occurred to me at one point that a way of doing that would be to give the model its own material integrity, a ‘truth to materials’ in other words .. i.e. 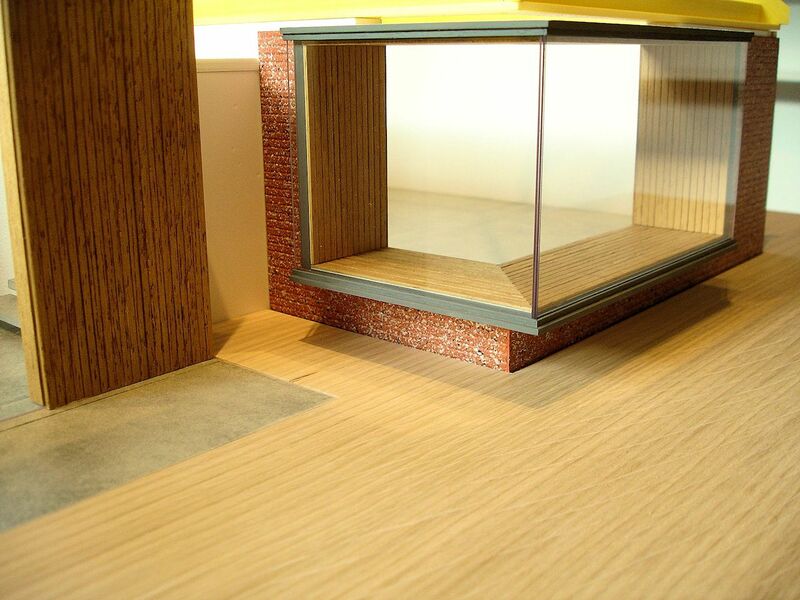 by using real oak, even real glass, and even real brick! But in practical terms this hardly ever accords with the functional remit, important in this case, of keeping to scale! So I couldn’t explore that direction at this time. 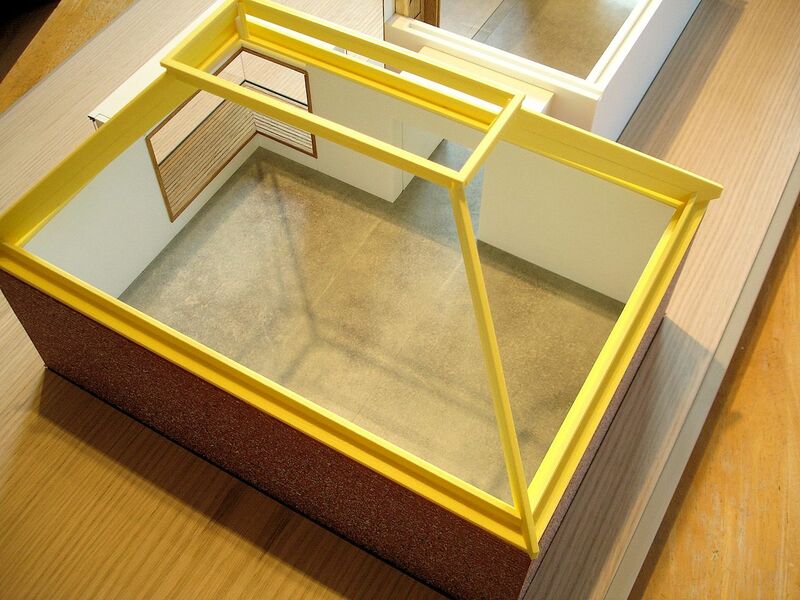 On the question of real wood, there are only a few woods suited to fine-scale model work and fewer available in thin strips or sheets. 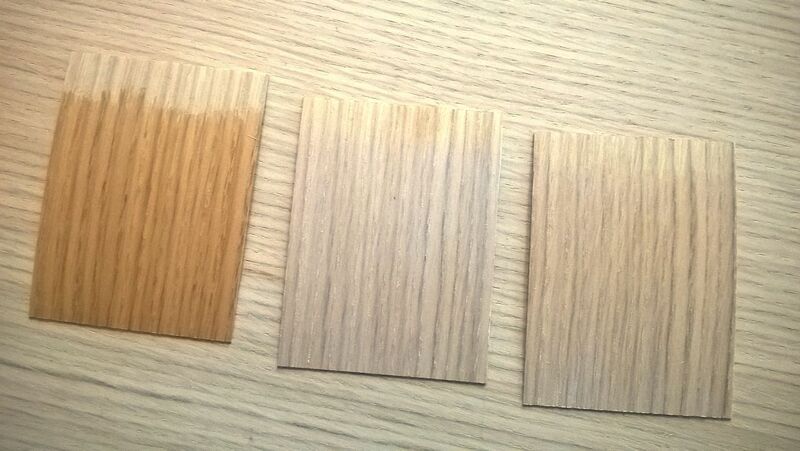 Oak, because of its hardness and strong patterning, definitely isn’t one of them. So I’ve taken obeche and stained it to represent oak. I could also have chosen limewood ( ‘basswood’ in model shops ), which is even more precise to cut, but I wanted to take advantage of the slight patterning which shows up when obeche is stained. The woodwork features in the architect’s design were mostly related to the window structures so the following group of photos serves to show both (the windows will be dealt with in Part 3). For this staining task I have used one of my favourite methods (suitable for both large or small work), which is to use a clear wax/oil based wood finish as a carrier, with a controlled amount of spirit-based stain mixed in ( it can’t be anything water-based ). I’ve found this much more successful than just using either a straight stain or a staining varnish partly because the wax/oil medium (along with anything added to it) penetrates the wood fibres more evenly, but also because it gives sufficient drying time to modify i.e. to rub away, or even out any excess. Spirit-based stains on their own can make woods like obeche or basswood too dark, unless they’re heavily thinned with white spirit. But then it’s difficult to control what appears once the wood dries out. 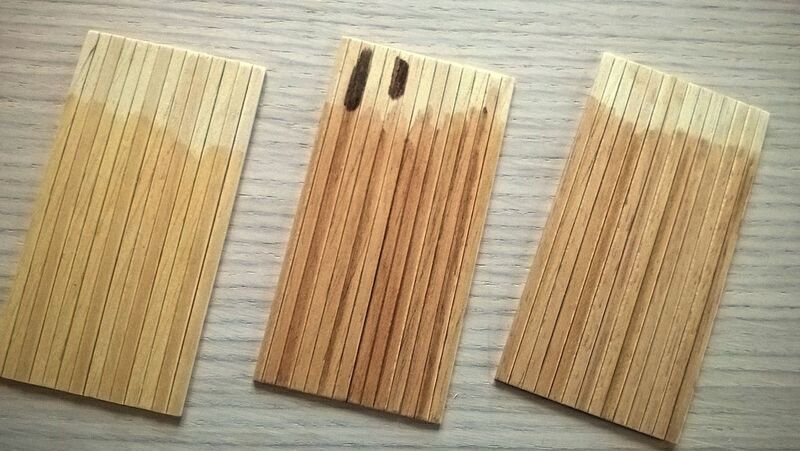 I made tests using wax/oil varnish with different amounts of Colron ‘Medium Oak’ and there was little difference between the wet and dried results. It was particularly important for me to make test samples here, because to reflect the distinctive tongue-and-groove cladding of the original I had to composit separately cut and sanded strips of obeche, otherwise there wouldn’t have been enough tonal difference between the strips. I was concerned though that staining might emphasize those lines in-between too much, but these turned out fine. On the left above I’ve just tried the wax/oil carrier on its own, and for the other two I added small amounts of Colron ‘Medium Oak’ Wood Dye. For those other two I also experimented with adding a little more colour variation using alcohol markers. I did this before the wax/oil was dry, though I think this could be done at any later stage. It shouldn’t be done before the wax/oil goes on though! .. I tried this with the same markers at the top of the middle sample piece. 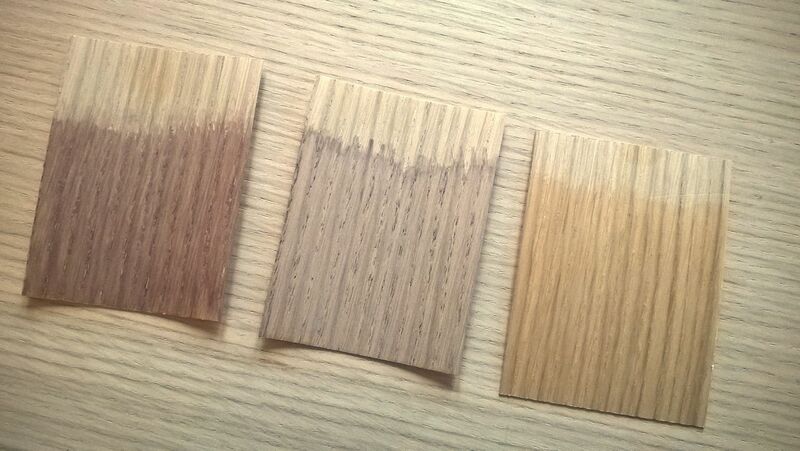 They came out much darker on the bare wood, whereas on the wax/oil the effect and strength is much easier to control. 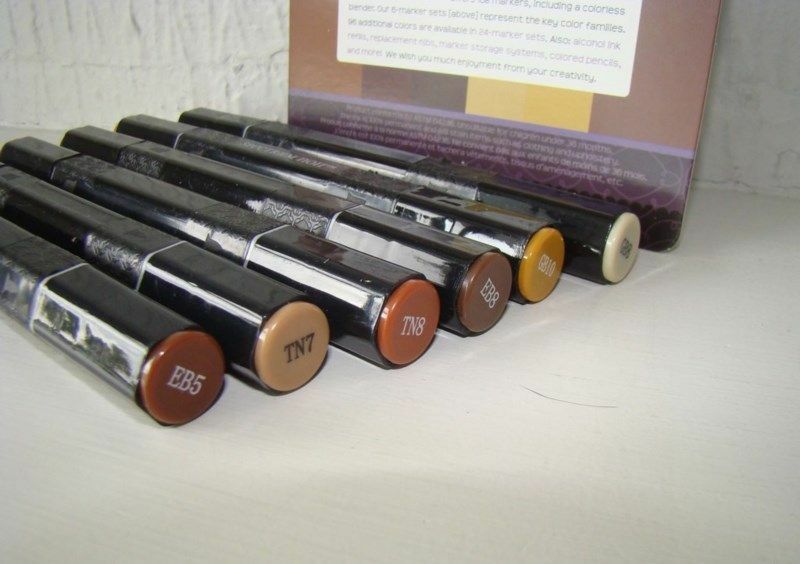 The markers I used were from Spectrum Noir available as a pack of six ‘browns’. I’ve found that these generally have a much richer ink than Winsor & Newton Promarkers, as well as lasting longer and being cheaper in the first place! The wax/oil medium I’ve used is from Osmo .. the photo above includes the tins I still have after more than 20 years and the wax/oil still works perfectly! I used Osmo products quite a lot when I was living in Germany, they were always available at Bauhaus (equivalent to our B&Q here). I used them not only to protect or colour wood, but also to seal or paint any similarly absorbent surface .. even plaster! In fact, it was a surprise but the Osmo treatment gave the cast plaster forms I was producing at the time the smoothest, best looking and most durable surface I could hope for! 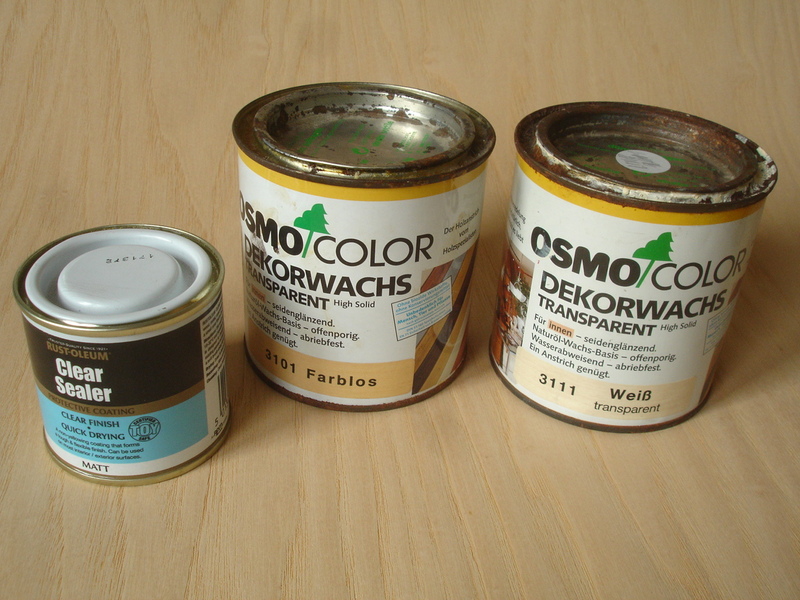 But Osmo ‘Wood Wax Finish’ (as it’s marketed in the UK) is intended for wood and comes either as clear, various whites, as a variety of wood stains, or in a small selection of basic colours. In this case there was every excuse to stylize, or rather generalize the brickwork exterior: it wasn’t an important visual part of the model’s function; I wanted to avoid slavish or fussy detail; and I wanted it to appear playful. 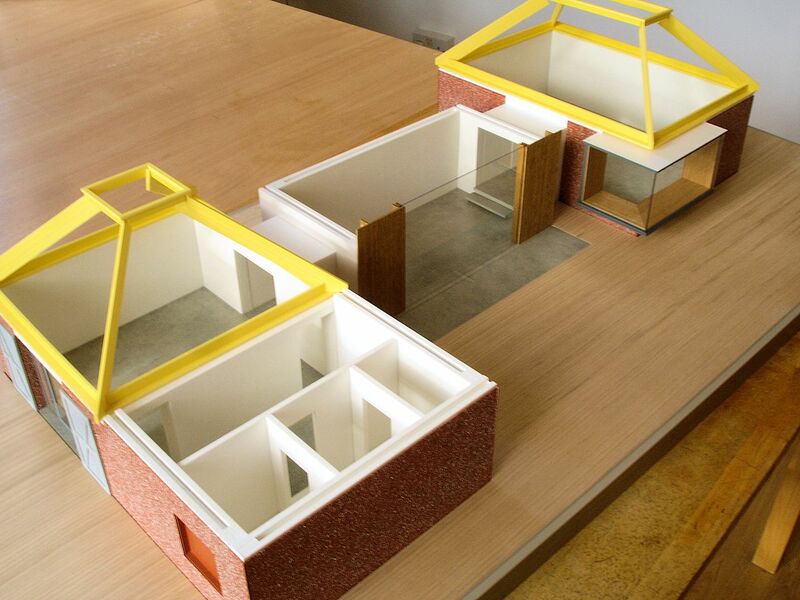 There was also the fact that I’d really only had the architect’s plans as a guide in making the model, with just a few on-site photos available, so it was also a case of playing it safe. I wanted to emphasize the ‘warm and friendly’ in brick .. the ‘toy’ version of it, as I’d said, or as I imagined it might look mass-produced. I wanted to get a sense of textural richness and unifying pattern too, but time-wise to be able to get it relatively quickly! Embossing horizontal lines in 1mm foamed-Pvc was the quickest way I could think of to suggest the basic ingredient of a brickwork surface, and I’d done some texture tests with Rust-Oleum texture-spray for a previous project. The two effects just seemed to combine perfectly for what I wanted. I used an embossing tool to score the lines in 1mm Palight. These are basically like scribing tools but with a rounded point instead of sharp ( in the UK, Poundland has them in their nail art section ). I had to try a few different orange or rust-red sprays to get an idea of the right direction for the base colour ( using red primers or leftover Montana cans ) before I could settle on the best .. MTN 94 Phoenix Orange. I left the sprayed pieces to fix more than day before going lightly over with Rust-Oleum ‘Pebble’ Stone Textured Finish. These Rust-Oleum sprays spit out tiny gobs and streaks in two colours at once and the effect is often better when subtle, but also I didn’t want to hide the base colour too much. 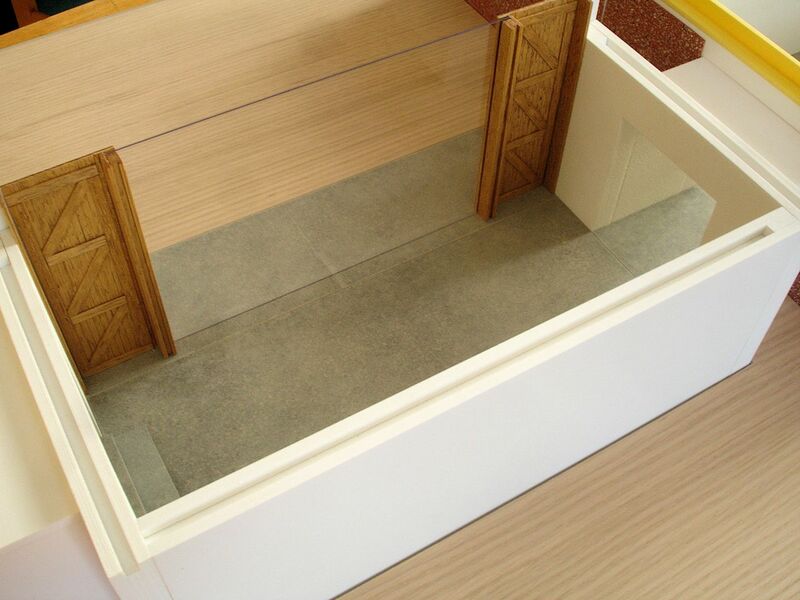 For the baseboard .. which is to be honest usually more hassle than enjoyment .. I was especially lucky that the smallest size of IKEA table-top suited the model perfectly! 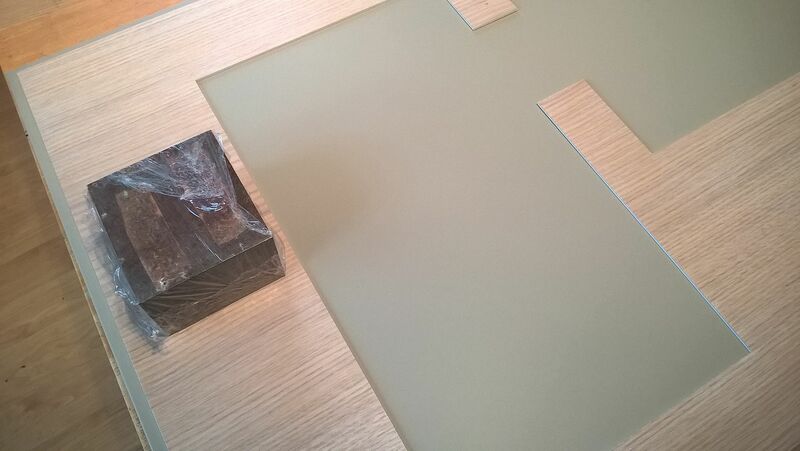 I’d strongly recommend these table-tops because they’re relatively light but suitably solid, in a variety of rectangular formats and a number of immaculate finishes including satin white, dark blue and beige. They also work out cheaper than ordering good quality MDF or plywood cut to size, plus if you pick up from store you can see what you’re getting. Incidentally, I like the idea of models having a certain size relationship with the human figure, just as pieces of furniture do. 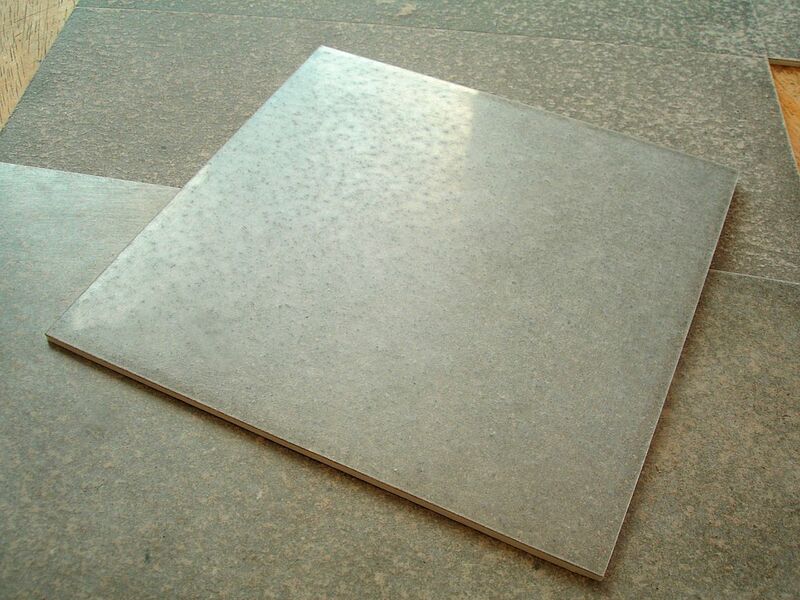 I feel that the small table-top format traditionally 4ft x 2ft average, now 1200 x 600, has a similar dimensional presence to a small person. As I’d explained in Part 1 of this write-up, the ‘building blocks’ of the model were designed to be removable and I wanted to give them clear ‘footprints’ to lock into. 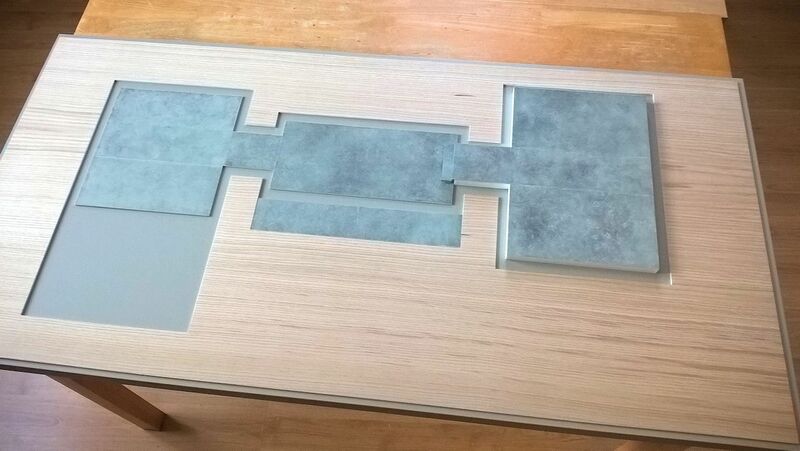 This meant a raised surround with the shapes cut into it, not just a sprayed design on the floor. I was thinking here of the tactile experience of making objects connect, of feeling the joining more, rather than just sliding parts around. 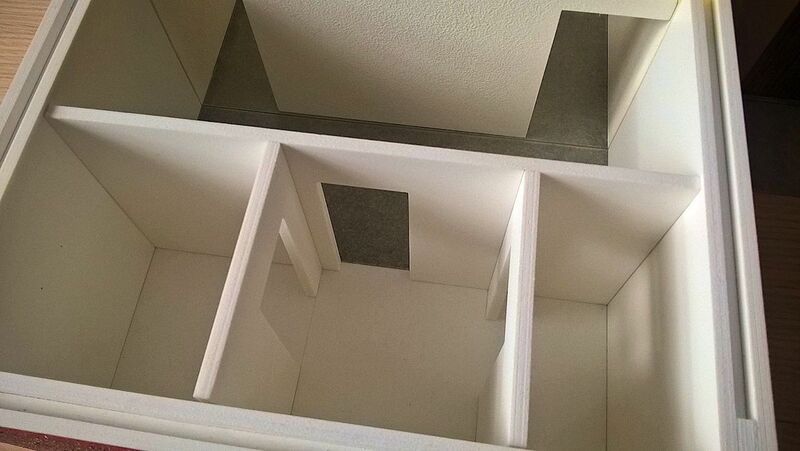 I cut the surround shape out of 2mm Palfoam (I’d waited to do this until I’d got all the room structures made, to make sure of a good fit). 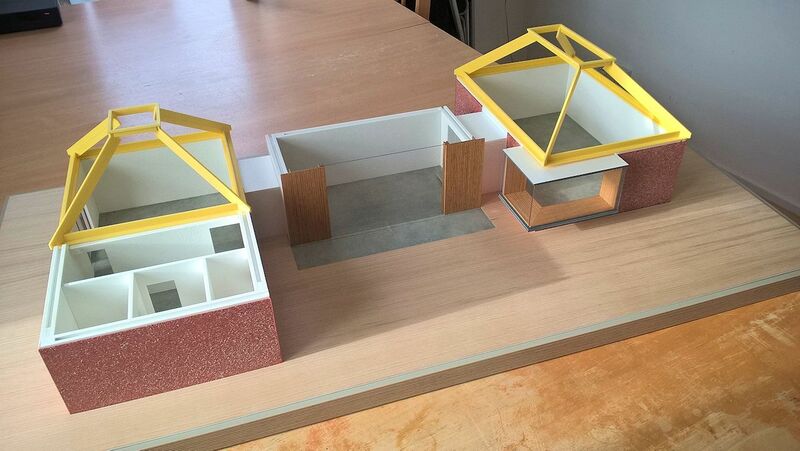 Instead of making each room as a box with the floor included I made them as open boxes to fit around floor shapes which became part of the base. I thought this was more interesting, as it gave the opportunity of revealing a more convincing ‘ground level plan’ underneath. We’d gone through a few ideas for possible treatments of the surround, including a blotchy watercolourist abstract suggesting tree and shrub shapes seen from above. But from later building site photos it was unclear to me how many trees and shrubs would actually be remaining, and in any case I was running out of time .. so after thinking about a variety of quick surfacing options which would never have survived, I chose oak veneer because it was sympathetic and felt appropriate. For the least possible hassle I wanted a veneer which was self-adhesive, also the best choice when cladding Palfoam. I’ve used these before and I’d recommend getting them from The Wood Veneer Hub because I think the prices compare well and delivery has always been quick. With veneers there aren’t usually many size options, for the 60cm width I required I had to get 2 metres, total cost around £45. 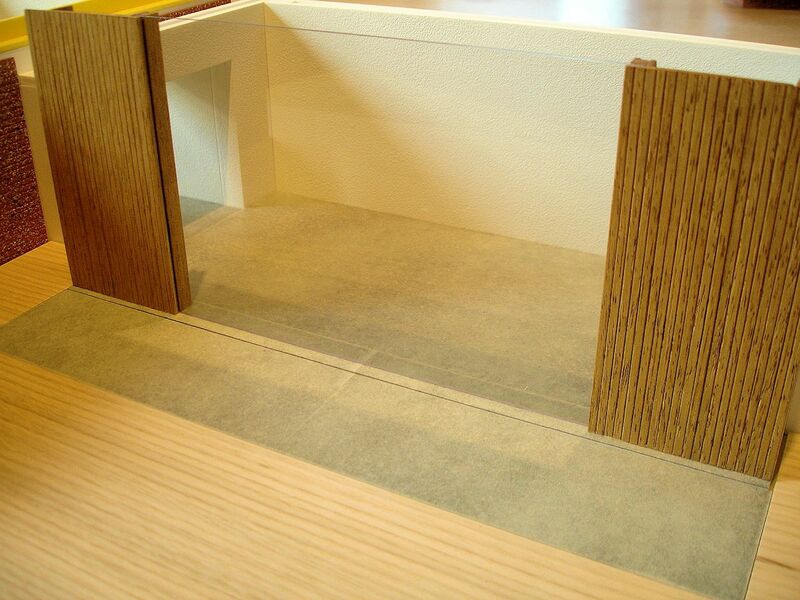 The best way of organizing the sticking in this case was first trimming the veneer to a little over the length; laying it glue-side-up on a flat work surface; peeling off the backing paper; then carefully and slowly lowering the Palfoam surround shape onto it starting from one end. The thorough directions that came with the product recommended using what they call a ‘veneer scraper’ in other words a hard plastic smoothing blade with which to press down on the veneer strongly while sticking. 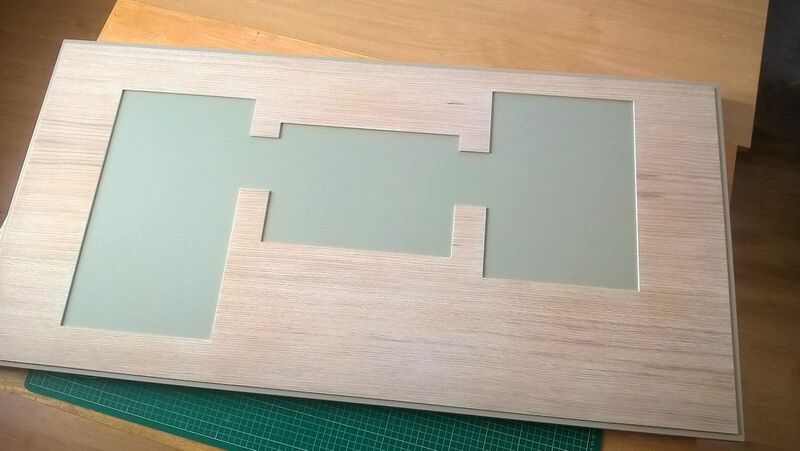 I didn’t have one of these but I cut a rectangle in Palight, sanding the edge a little to prevent it from scratching. The adhesive is very strong but I think it pays to be thorough i.e. just smoothing it down with the hand or a cloth wouldn’t be enough. Once this was done I could turn it over, place on a large cutting mat and trim the edges with a scalpel. Oak is a hard wood but the veneer is extra thin, so this wasn’t difficult. I’d made sure that I’d kept the backing paper so that I could put some back on the interior leftovers. Since I had trimmed the veneer from its underside, the final task was to smooth down all topside edges (120 grit sandpaper) because otherwise they would catch. 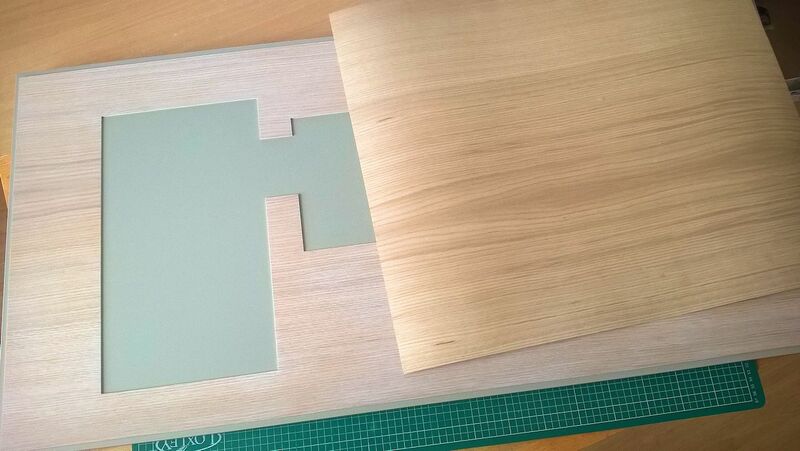 Wood veneer comes unfinished, that is, the wood surface may look beautiful and feel smooth but it will need protection from dust and dirt. Medium-tone woods like oak will quickly show darker finger-marks. So I knew that I would have to seal the wood surface but I really didn’t want it to go any darker. In the end I went a little the other way .. in the photo below I’ve laid a piece of untreated veneer over the final effect for comparison. It’s vital to make test samples before using any type of wood treatment because sometimes the results are most unexpected! Here below for example, the first two tests on the left were Rustoleum Clear Sealer a matt water-based sealer I’ve used in the past on lighter woods such as ash or sycamore. On those it worked perfectly, the sealing coat was practically invisible with no change in colour or tone, but for some reason on the oak it couldn’t have been more different! As a second test, I diluted the sealer 1:1 with water, and this was different but still surprising. For the third on the right I tried Rustoleum Furniture Lacquer a matt spirit-based finish which is normally intended as a protective coating for chalk paint. This result was much more as I’d expected. In the end I went for the Osmo Wood Wax Finish, mixing the clear version I had (No. 3101) with some transparent white (No. 3111). Below from the left is the straight clear, then the transparent white and lastly a 1:1 mix of the two which was the final choice. With any mix like this which contains some pigment it’s important to use a soft flat brush and to keep working the liquid into and over the surface to avoid any pigment pooling. In the course of working on this base layer I successfully solved a problem which had troubled me for a long time. 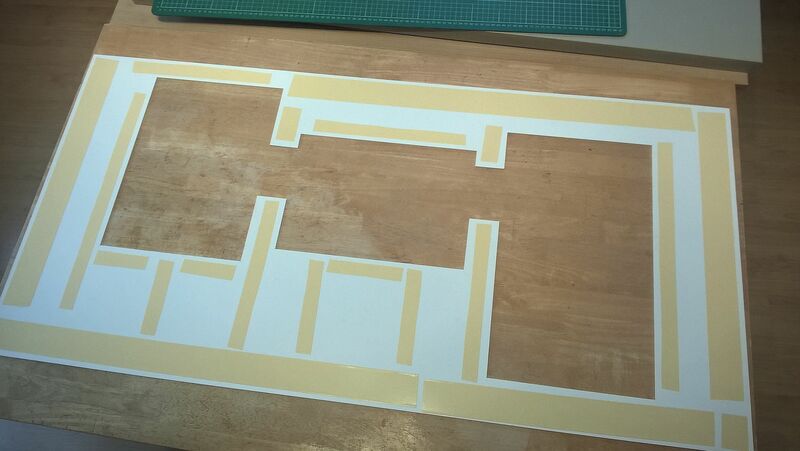 How can you place a large cut-out shape (such as the one above) into exactly the position you want it (with a nice 1cm margin all round in this case), making any slight adjustments that might be necessary, but then stick it down without moving it from that exact position? Of course I’d thought about pencilled corner guides, even little corner blocks, to fix the position for later when the glue-covered surface is impatiently waiting! That’s the whole problem .. anyone who’s tried to manoeuvre a large, bendy, sticky sheet into exactly the right position before any of it starts sticking anywhere it shouldn’t will know the problem! I solved the problem, thanks partly to double-sided carpet tape. 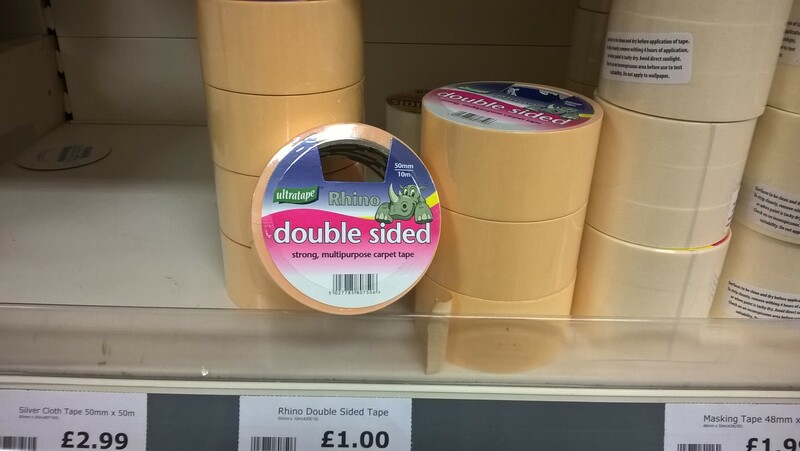 This is a good one .. ‘Rhino’ Double Sided Carpet Tape, from Ultratape .. I’ve used it for years and it’s often sold very cheaply for some reason. I knew that this kind of smooth, thin carpet tape would be fine for securing smooth Palfoam to a smooth, manufactured surface (in this case painted MDF). It just doesn’t usually hold that long on porous, dusty or uneven surfaces. I hoped that I could take full advantage of the fact that the tape could be fully applied, as shown below, and then stripped of its non-stick covering, but in stages. Take note of the little square of tape that I’ve put in the bottom right corner. Once the taping was done I turned the sheet over, positioned it on the baseboard exactly as I wanted it, but then put whatever weights I had near the far three corners leaving that corner with the square of tape free. I could then carefully bend that corner up a little just to get at the tape covering and pull it out with tweezers. Then I could press this corner firmly down. Now it’s stuck at one corner and all the other corners are still fine. Then it was a case of carefully repositioning weights so that enough of the sheet could be flexed to get at the end corners of tape lines, to pull out the covering strips .. progressing in this fashion roughly diagonally from where I started. Incidentally I had to use this photo taken to remind myself where I’d put the pieces of tape because they’re not all easy to see once the sticking starts. 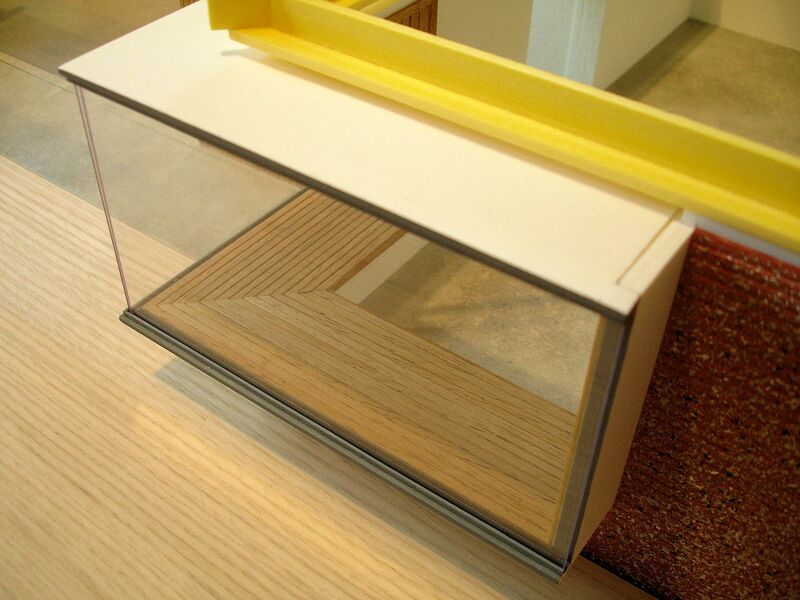 In the final part to come I will be looking at the various options for making the windows in the model. 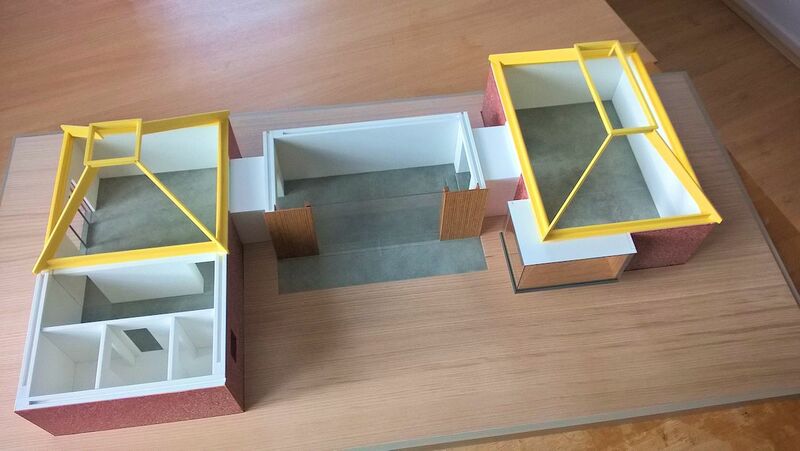 I was asked to make a model of gallery rooms newly added to a private house in Hampshire, and have been working on this part-time for the last few months. The focus was on the interiors, since the idea was that the owners could use the model to explore different arrangements of the contents, but it was agreed that the model could also have an aesthetic presence of its own .. as a sculptural object in itself .. so I took the freedom to stylize aspects of the exterior and to avoid fussy detail. After initial talks with the friends who’d commissioned it the model developed its ‘plaything’ nature .. somewhere between dollshouse and construction kit .. as it progressed. 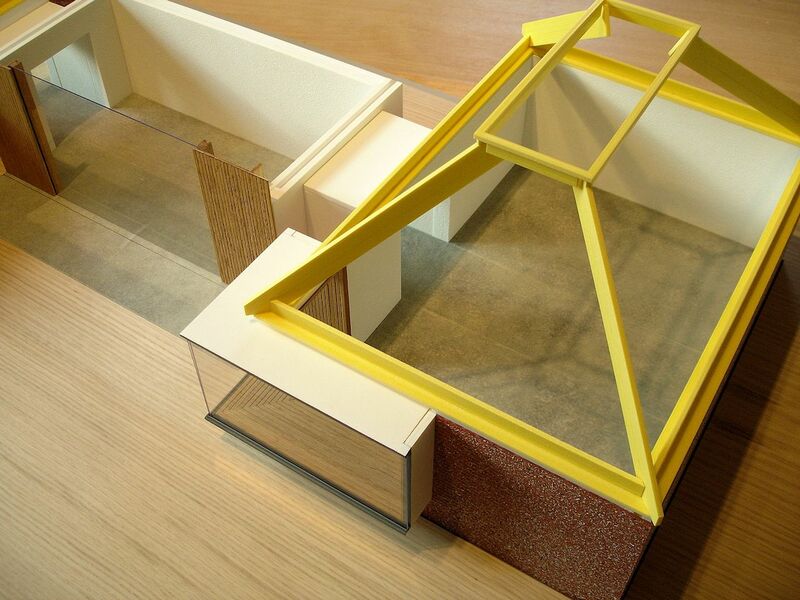 From the beginning the plan was that there would be detachable sections, making it possible to peer into parts of rooms, but that these ‘building blocks’ could be quickly and cleanly reassembled again. 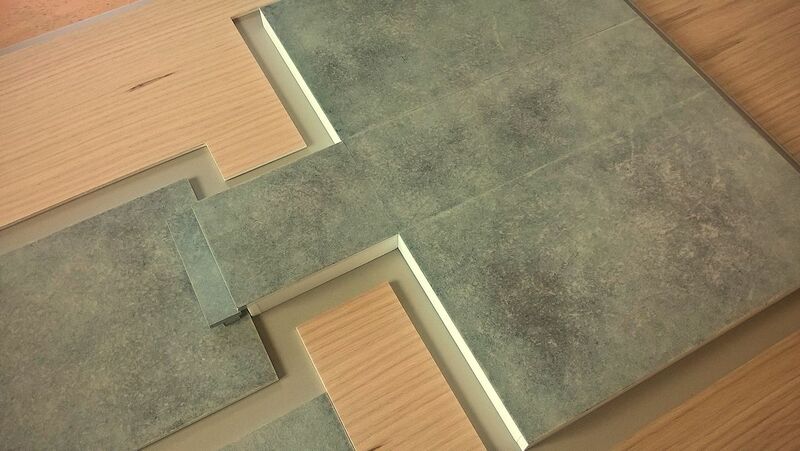 This suggested a baseboard with cavities into which room sections could be slotted into place .. further adding the qualities of ‘jigsaw’ and ‘puzzle’ to the aspect of play. We wanted the roof structures to be represented, mainly to illustrate how the interiors are crowned by these light-receiving cones. But I only wanted to ‘outline’ them as it were, and they needed to be detachable. Giving them any suggestion of their external nature would have made them too heavy-looking, so I took advantage of their separateness to make them ’emblems’ in yellow Palight. Once again I wanted to use my favourite foamed PVC for most of the build, because it is one of the most manageable and versatile materials I know! Using this would also mean that the individual ‘room blocks’ would not become too heavy while still being structurally very solid. At the chosen scale of 1:25 the main walls came to roughly 15mm thick in the model, while the interior walls could be represented with 5mm. 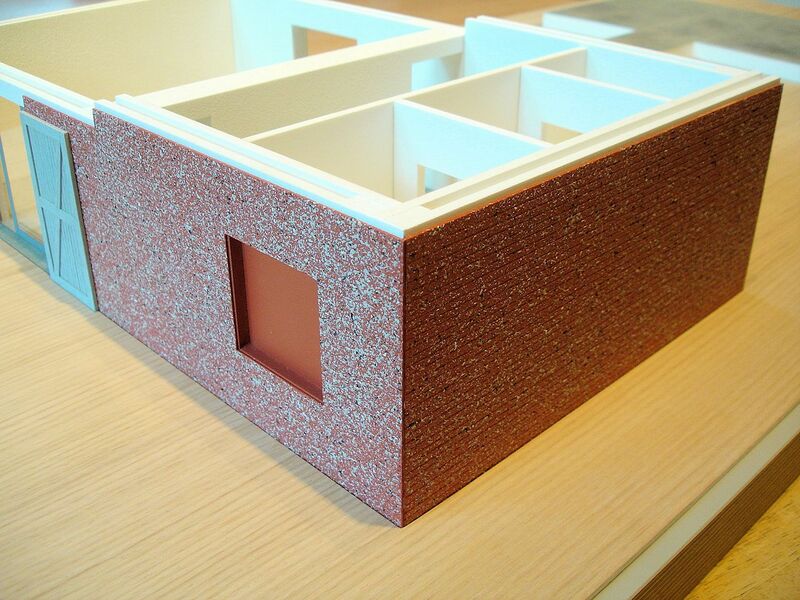 I had quite a large stock of 5mm, but I chose to build each section of thick wall as a ‘sandwich’ i.e. 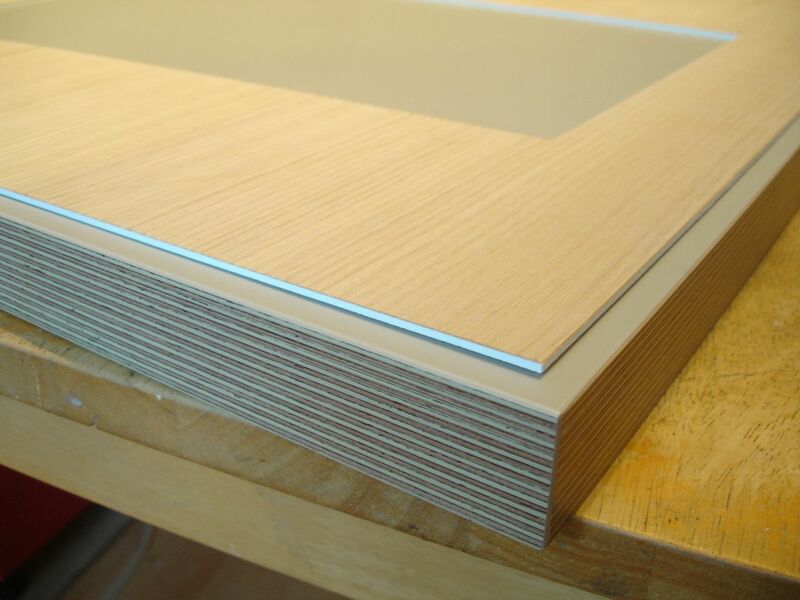 solid 5mm PVC both sides, with a 5mm thick framework in between. This was partly to reduce the weight ( and therefore the stress on the boxes ) a little more, but also because I wanted to build in a continuous groove along the tops of the walls to slot the ceilings into. In retrospect I wouldn’t do it this way again if I could help it .. it was an awful amount of cutting, sanding, aligning and gluing! Here in the UK Palram’s ‘Palight’ brand foamed PVC is available in white or a small selection of colours, and comes in a few different thicknesses. But of the white only the 1mm thickness is actually Palight. In the thicknesses from 2mm to 10mm ( there used to be thicker, but no longer it seems) the material is Palfoam. This is important to know, and to check when ordering, because Palfoam is softer. This makes it even easier to cut ( with a scalpel for example, as I do, and especially if one cuts along the extrusion grain i.e. along the less bendy direction ) and it glues together even stronger because the cut edges are more porous. But the surface of Palfoam is much more susceptible to scratching, so something needs to be done about it if it’s being used for a model that’s going to be handled. 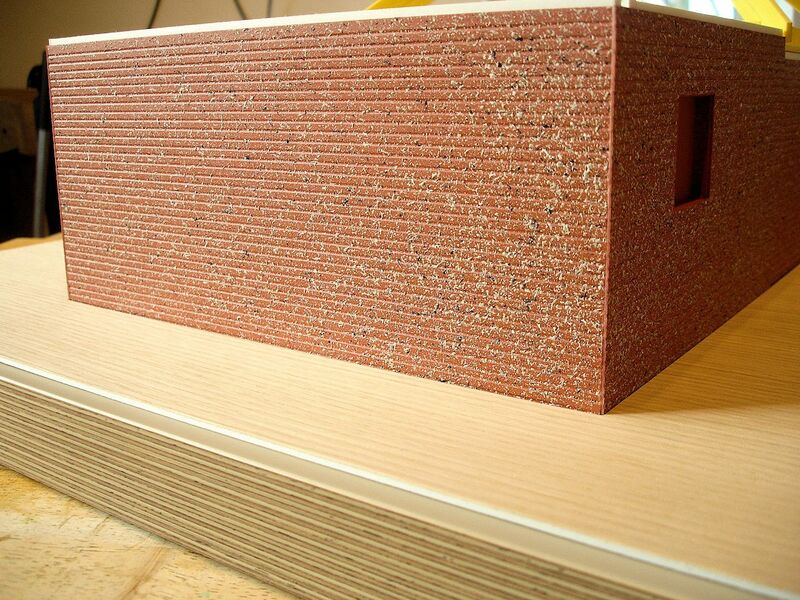 I knew that I was going to clad the outsides anyway with whatever I came up with for the brickwork effect, so my first task was to find a covering which would be suitable for the interior walls, which in reality were just white-painted plasterboard. Apart from the practical durability aspect I wasn’t happy with the idea of just white PVC walls anyway .. it’s the most uninteresting, lifeless form of white! One possibility was cladding the interior with Daler Rowney ‘Georgian’ oil painting paper ( on the left above ) which is quite a tough 250gsm, primer-coated and ‘linen’ textured paper. This is available as pads or sheets. 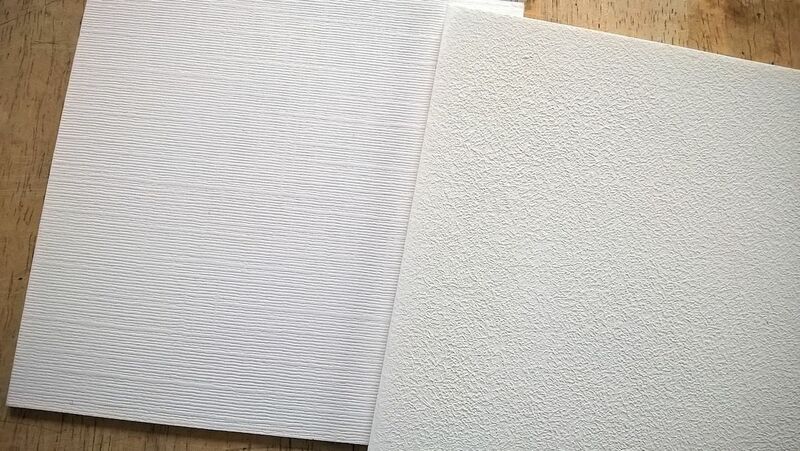 The other idea was evenly stippling Polycell’s Fine Surface Polyfilla directly onto the PVC ( shown on the right ). I’ve textured PVC this way before so I know that it stays put and resists scratching better than the plastic alone. It’s tricky at times to maintain an even quality of stipple, and the oil painting paper was the easier and quicker of the two to do, but I was worried that the paper could scuffing at the edges after repeated handling. Fine Surface Polyfilla is also a more sympathetic, slightly warmer white, so I chose this for the wall treatment. The most important aspect of the interior, the part which needed to look ‘convincing’ above all else, was the polished concrete floor. 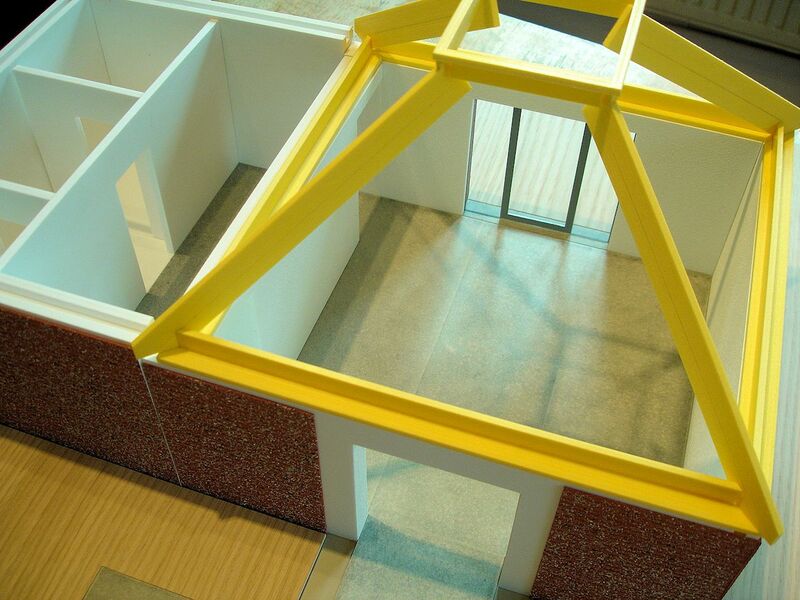 Especially so, since floors assume greater significance in models than in real life, because we’re mostly looking straight down on them. That usually can’t be helped, but it’s one of the reasons why we chose to make the model in removable parts, making it possible to get more of the ground level perspective. 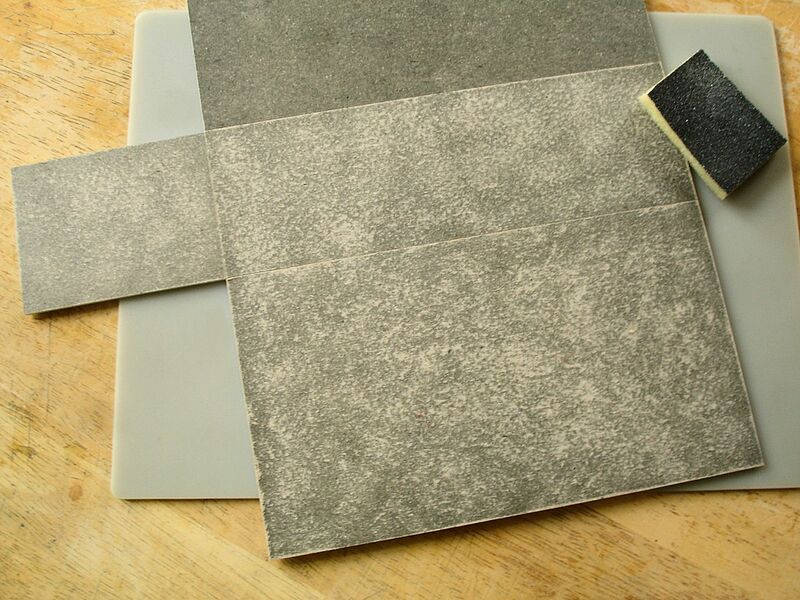 I was originally going to go with a method I’d tried before, using matt photo prints of actual concrete and achieving the polished look by spraymounting clear acetate on top. I’ve used this technique for very convincing marble or polished wood, easy to play around with because the parts can be ‘tweaked’ separately instead of having to achieve it all-at-once, and satisfying to look at because the surface effects ‘come from within’ rather than lying opaquely on top. Incidentally, it’s interesting to observe from the last three photos how .. even in simulations! 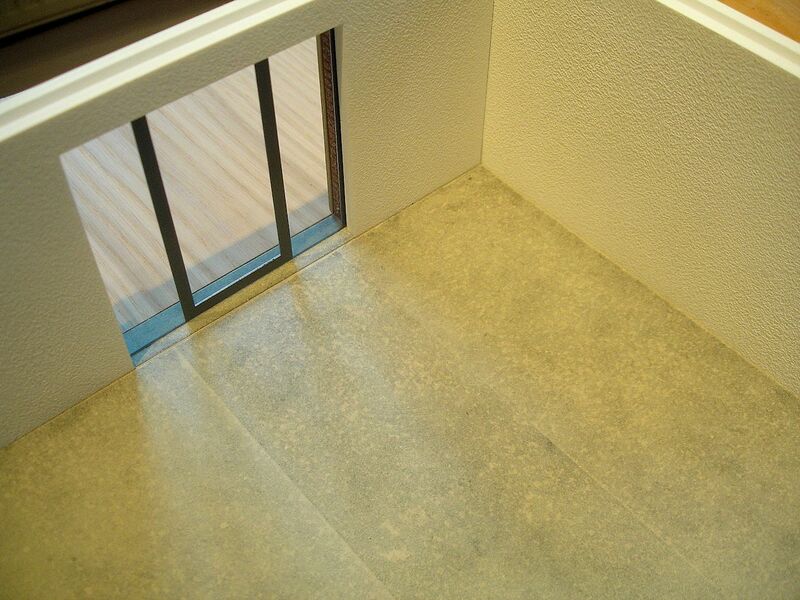 .. the particular warm greenish-grey of concrete can alter quite a bit dependent on the light. I’ve noticed many times in real life how much concrete can change its mood under different lighting. As I was saying, I’d planned to create the concrete with photos but by chance I happened to have a cheap, recycled paper that worked even better as a basis. 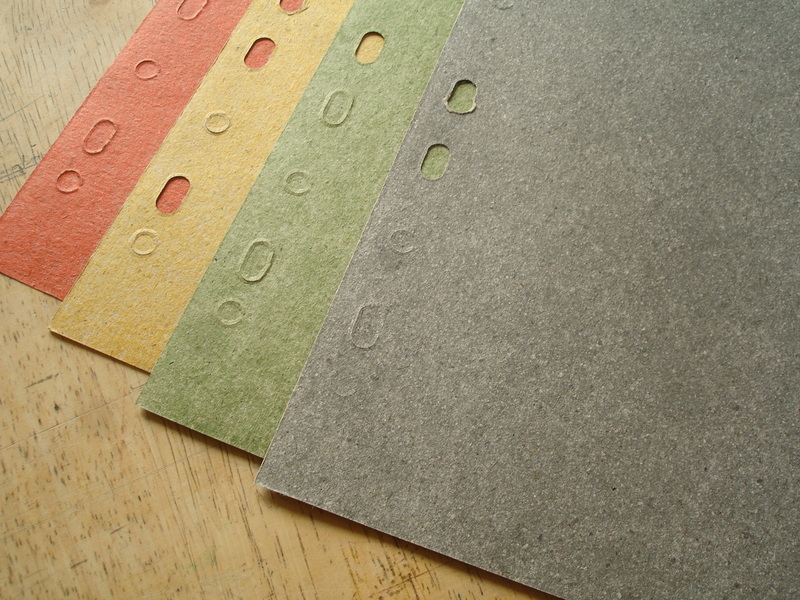 These (above) were file dividers found in a £shop which I’d kept because their back surface was interesting. The grey ones were a good basis in terms of colour and mottling, a suitable warm greenish-grey, though a little too dark and too even. But I found that if I use a sanding sponge on the paper I could make it lighter, while giving it a bit of animation. 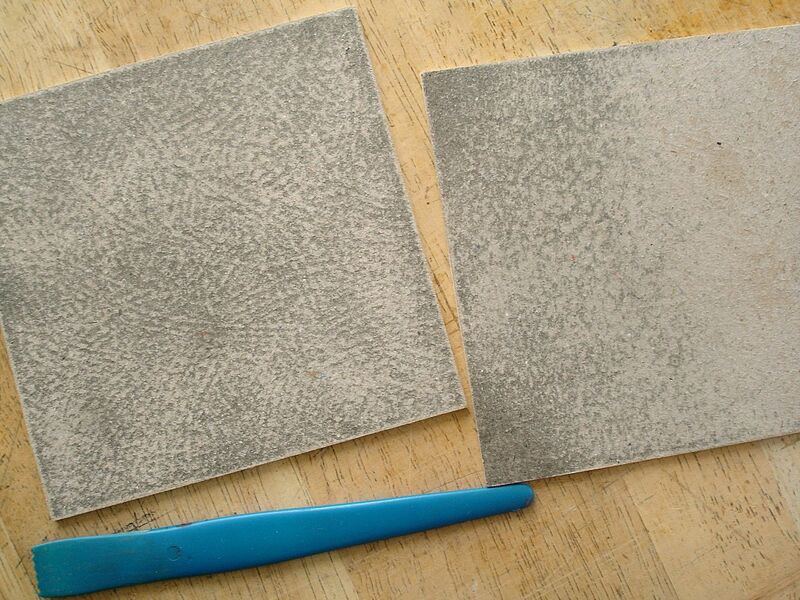 Embossing the back first with a serrated modelling tool created other distinctive patterns in the paper when sanded. I didn’t want this kind of patterning in this case, but it’s an interesting effect. 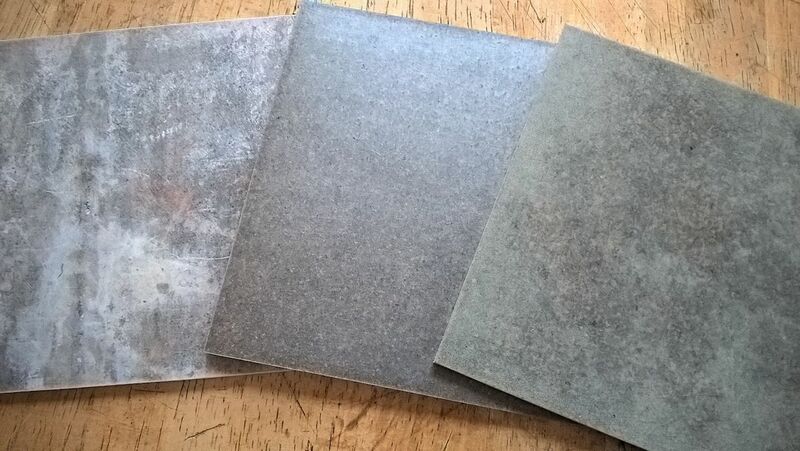 I had to cut the floor pieces out of 2mm Palfoam first, clad these in the paper ( spraymounting down using 3M’s Craft Mount, the strongest ), modify the paper surface by sanding, vacuum the surface to remove any dust .. then I could apply the acetate. This is straightforward ‘transparency film’ designed for printing on, sometimes also called ‘OHP film’ ( for overhead projection ). Hence it’s surface feels slightly rough on one side, because there are micro-deposits of clear priming material to help the ink to fix. It is this side of the acetate that needs to be spraymounted, then laid and firmly rubbed down over the paper. Now the glossy side of the acetate is on top. 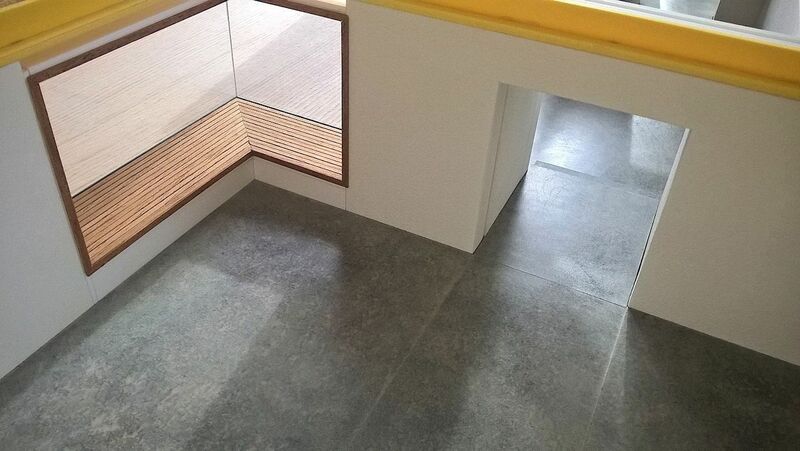 This is usually too glossy for a polished concrete surface ( though it depends what look you’re going for) so I take some of the gloss away by rubbing either with a kitchen scourer or very fine sanding sponge ( the kind painter/decorators use for matting paintwork ). This will deepen but also slightly lighten the effect. I felt in the end that my polished concrete was still a little too dark and not ‘beige’ enough, so I gave all the pieces a light and mottled dusting with Belton Molotow ‘Stone grey light’ spray paint. Above .. to the left is an example of the photoprint method (which in this case was far too busy and specific); in the middle is the recycled paper/acetate version; and on the right the final adjustment adding a dusting of spraypaint. In the next part I will be talking about the baseboard, describing my methods for staining woodwork, and a ‘generic’ or stylized treatment for the brickwork.